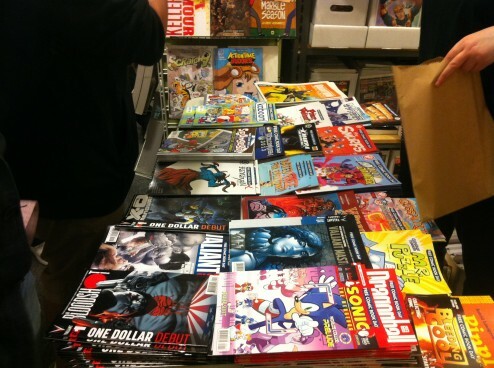 The days of expansive comic book stores are numbered as more readers go digital forcing physical shops to downsize. With access to applications like ComiXology, readers are able to download their favorite issues digitally to their smartphones or tablets, anytime and anywhere there’s Internet connection. And, just as iTunes signaled the death of the record store, a similar sense of mortality is creeping upon the neighborhood comic book store. Last year, Comixology CEO David Steinberger said in an interview with the tech publication, “WiRed,” that users had downloaded 25 million comics from the digital comic platform. That same year Diamond Comics Distributor, the sole book distributor for comics, sold an estimate of 31 million comics through May of 2012. While these sales numbers were estimates that did not account for international or graphic novels sold through Diamond, the growing popularity of ComiXology has comic shops feeling the pressure. Shop owners, like Robert Conte of New York’s Manhattan Comics, has had to adjust his inventory to compete with the new digital market. He no longer carries as many action figures or memorabilia, and instead sells more trade paperbacks of high selling heroes such as Spider-Man and Batman. Conte said he was constantly conflicted between stocking what he wants to carry and what actually sells. One-time comic store staples, like long boxes filled with older issues saved for enthusiastic collectors, were getting the axe. However, stores like Conte’s can’t compete with ComiXology’s unlimited inventory and 24 hour accessibility. Accessible through their site or application, ComiXology’s store boasts over 30,000 comics from 75 different publishers like Marvel, DC, Image, IDW and Valiant. Founded in 2007 as a digital pull list service that allowed users to track what they wanted to buy in stores, ComiXology revolutionized the comic book and graphic novel industry by delivering a cloud-based digital comics platform that made discovering, buying, and reading comics more accessible than ever before. John D. Roberts, co-founder of ComiXology, said in an email interview that his application had completely altered the comic book industry by appealing to a broader audience. 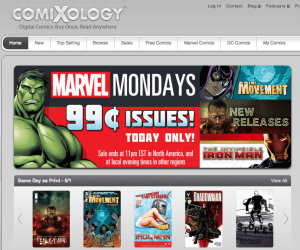 Notable comic publishers such as Marvel, DC, IDW, and Image sell their books through Comixology. This has made the app the only legitimate digital equivalent a physical retail store. However, this is not desired competition from comic book stores, who are already struggling to stay afloat with higher comic book prices and a diminishing demographic of young readers. Though rolling with the punches, Conte said he firmly believed that digital has its place but cannot compete with a dedicated comic book shop. The digital experience is more than just swiping on a tablet, however, as the device’s backlight and the ability to zoom along the pages allows for easy reading at any time. Depending on a device’s resolution, the coloring and art of a book can be visually enhance, showing the true talent of the industry. The issue of shelf-space, something many readers struggle with, is non-existent as the application stores each issue in its digital library. However, it is only accessible with an Internet connection, and longer books may require longer loading times during reading. Issues such as these are why many fans are holding out from going completely digital, still preferring to read physical issues from their local comic book store. Stores like JHU Comics offer a friendly, welcoming atmosphere to attract new and returning customers to their shop. Customer loyalty and strong word of mouth are what keep shops alive, especially in a densely populated city like Manhattan. Stephen Norman, store manager at the recently renamed JHU Comics (formerly known as Jim Hanley’s Universe), hasn’t seen a significant drop in the store’s physical comic sales – at least not yet. Norman prides his store’s strong customer loyalty due to its membership programs, special events, and friendly staff. However, the revolution has not only affected comic store owners but the comic creators themselves. As more people read comics for the first time digitally, Robert said that the industry will see changes in the way comics are produced. Even with this innovation, Norman said publishers are still trying to figure out how to utilize digital distribution without eliminating shops. While publishers and storefronts continue to struggle with the new medium, independent comic creators have embraced the digital frontier. Comic creator, Eric Alexander Arroyo, is a senior cartooning student at the School of Visual Arts and author of the webcomic “Punch Gun.” He has sold his books through JHU Comics, and is currently preparing his work for digital distribution. If the digital industry keeps comics afloat Dan Parent, a veteran writer and penciler with Archie Comics, said he’s all for that. As ComiXology works to bridge the gap between young and old readers, there is aspiration to inspire higher standards for comics as a result. In the meantime, Roberts and his team are working hard to continue to play a major role in the revolution.